What is a line? In poetry, a line is a group of words assembled in a phrase that may or may not have a traditional sentence structure and punctuation. In tenth-grade geometry, we learn that a line is a path between two points. For Erin Wiersma, who has a solo at AIR gallery this month, line – made slowly and confidently on paper– is a unit of time. Hand mixing pigments with polymer binders, some of Wiersma’s layers are opaque and others transparent; some are added and others subtracted. The densely layered images start with one mark, akin to a heartbeat on an electrocardiogram. Like life, they become more complex and knotty, more exquisite and peculiar, as the lines and erasures accumulate. 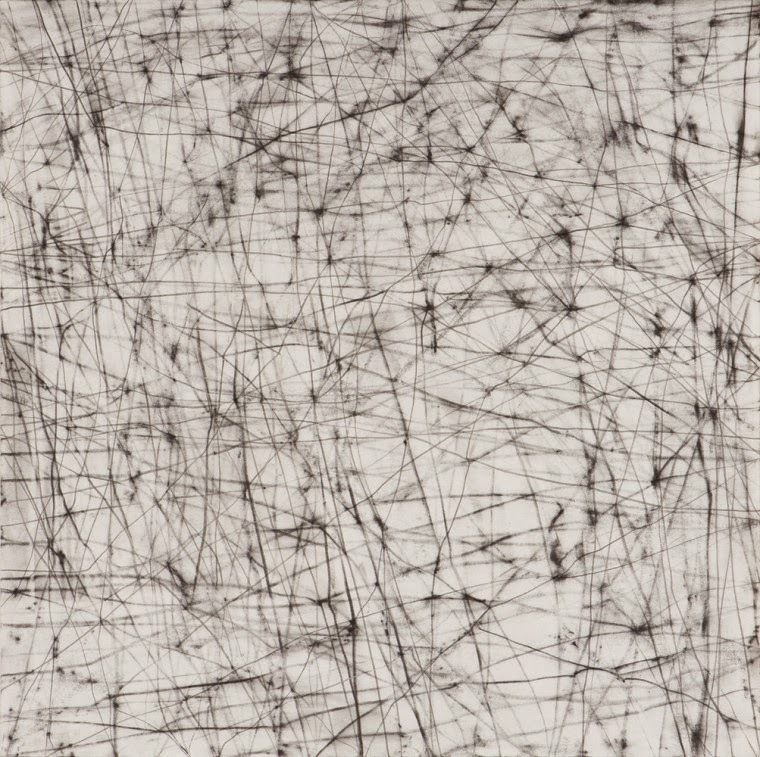 Erin Wiersma, Examen, 7/24/2014, 2014, dispersed pigment on paper, 33 x 31 inches. Chuck Close famously said that while “amateurs look for inspiration, the rest of us just get up and go to work.” Wiersma seems to accept his tough wisdom, as each day she abjures any handwringing over whether she’s inspired yet, gets out her drawing materials and settles in to work. At the same time, she embraces Close’s implicit assurance that, through the process of concentrating on the project at hand, inspiration will eventually emerge. With single-minded deliberation, Wiersma fills the paper with meandering lines that appear to begin and end somewhere beyond its edge, a small piece of a larger whole, gaining psychic momentum until a complete drawing, both meticulous and open-ended, emerges. For Wiersma, drawing is not the means of creating a two-dimensional illusion but an intimate performance of expansive moments she experiences during the art-making process. As she shifts through intervals of thought, the physical process of drawing creates a stillness, enabling a new kind of perception to emerge. For viewers willing to slow down to apprehend the quiet drama that has taken place, the final work recalls and illuminates those moments. 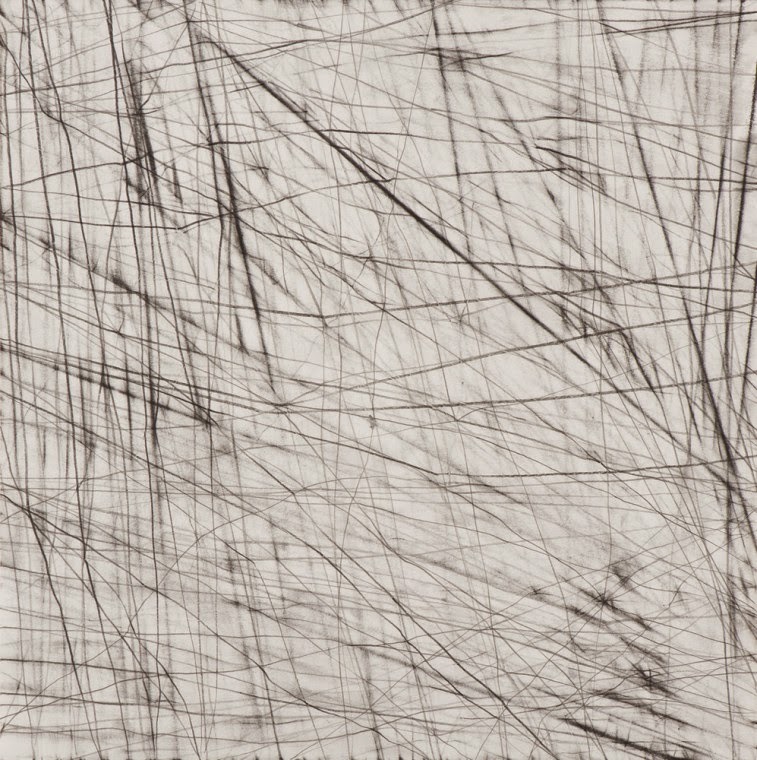 Erin Wiersma, Rote Lines, 6/26/2014, 2014, graphite on paper, 12 x 12 inches. Wiersma’s all-over compositions evoke Jackson Pollock’s drip paintings. But her existential concern also conjures other retrospective and contemporary influences, such as Lois Dodd’s daily perceptual practice and On Kawara’s date paintings, in which time and concentration are more central than action and emotion. Younger artists like Oliver Arms, similarly concerned with our increasingly fraught relationship to time, are using their studios as refuges for contemplation against the phenomena of information overload and social networking that have shattered the traditional structure of daily life, displacing deliberate and durable old-fashioned activities like reading books and writing letters with the high-tempo but evanescent exigencies of the Facebook update, Snap-chat message, Instagram stream, and Twitter feed. As we get older, and experience accelerating cycles of IT innovation, time only appears to move faster, and increasingly we seem to be cheated out of what’s left of our lives. Wiersma offers a powerful remedy to this pernicious distortion by slowing down a presumably overtaxed mind through the process of drawing, deliberately recording life in real-time rather than letting it pass unnoticed. Elegantly capturing time as line, Erin Wiersma suggests that in a roiling world that obscures and devours units of time, pausing to remember and articulate even small ones matters all the more. As we live our absentminded lives in a hurried digital age, that is a quiet inspiration. 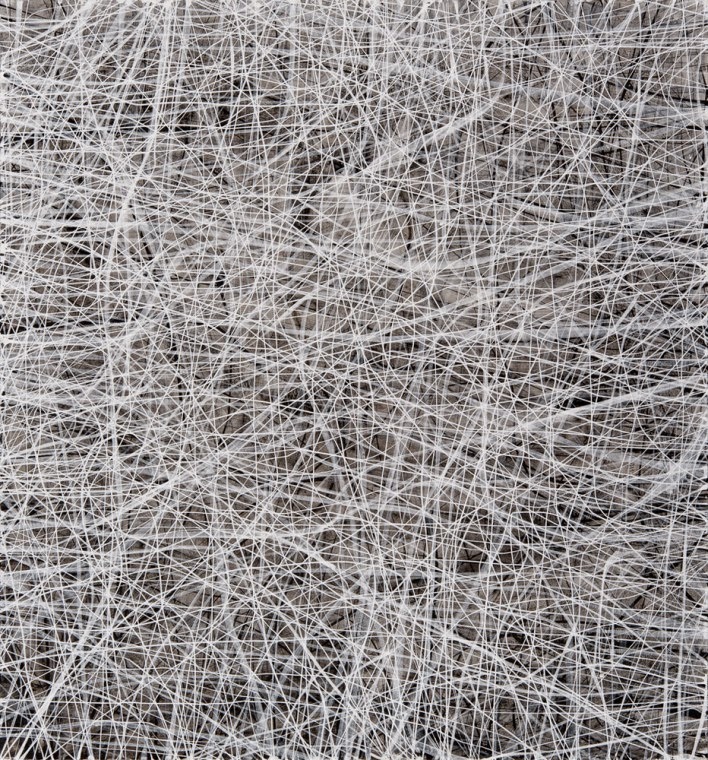 “Erin Wiersma: The Theory of Line,” AIR Gallery, DUMBO, Brooklyn, NY. October 30 – November 29, 2014. Opening Reception: Thursday, November 6, 6-9pm. Note: This essay was written for the catalog that accompanies the exhibition.